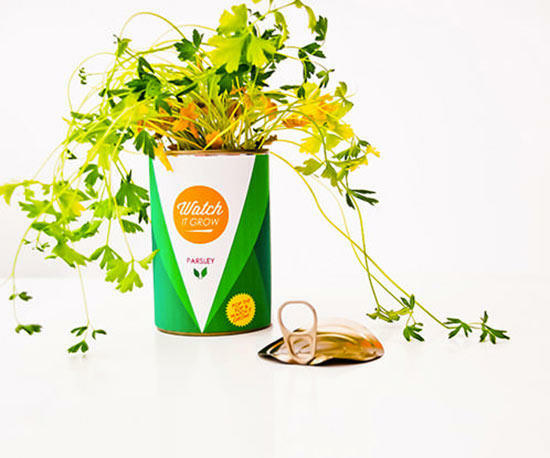 Use funky and unexpected planters to grow herbs, vegetables, and houseplants with ease and style. Gardeners everywhere are laying down their roots with ease and a bit of a flourish, too, thanks to a variety of indoor gardening ideas. 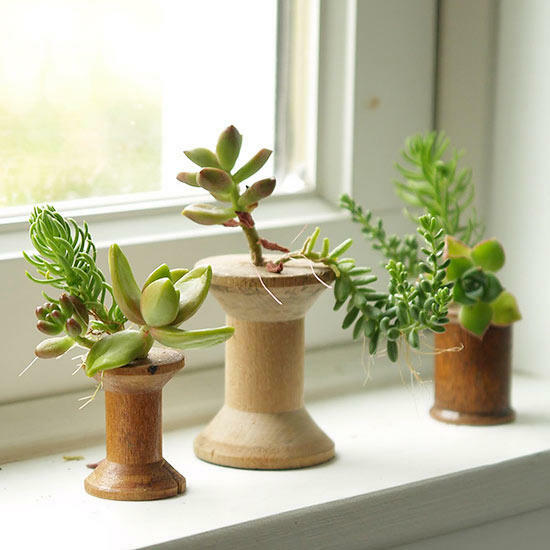 Glass jars, wooden spools, rolling carts, and macramé hangers are few of the many creations for indoor garden containers. These clever makers are successfully bringing the outside in by thinking beyond the standard potted plant. If you're worried about the recent bar cart trend fading away and leaving you with wasted space, don't worry! 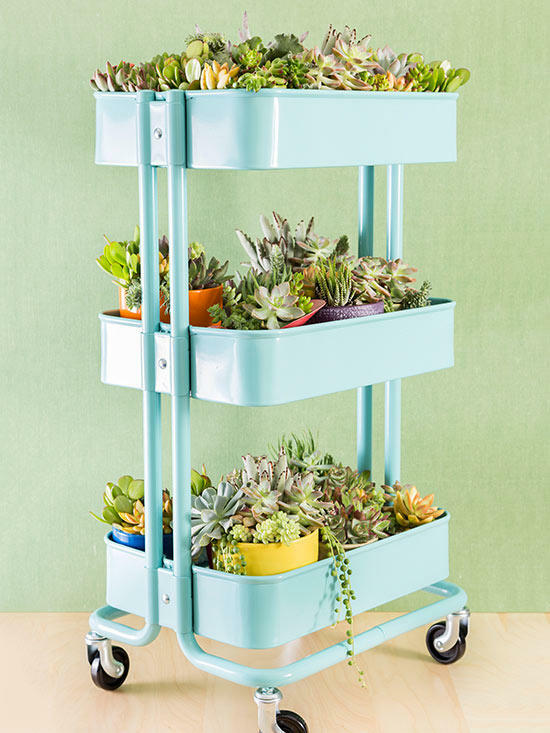 Your cart can easily be repurposed into a rolling succulent display. Just add mesh for drainage, then fill the compartments with soil for an easy in-home garden. Finish this indoor garden design by laying moss onto the surface and plant your favorite varieties of succulents and flowers. Project created by Cassidy Tuttle. 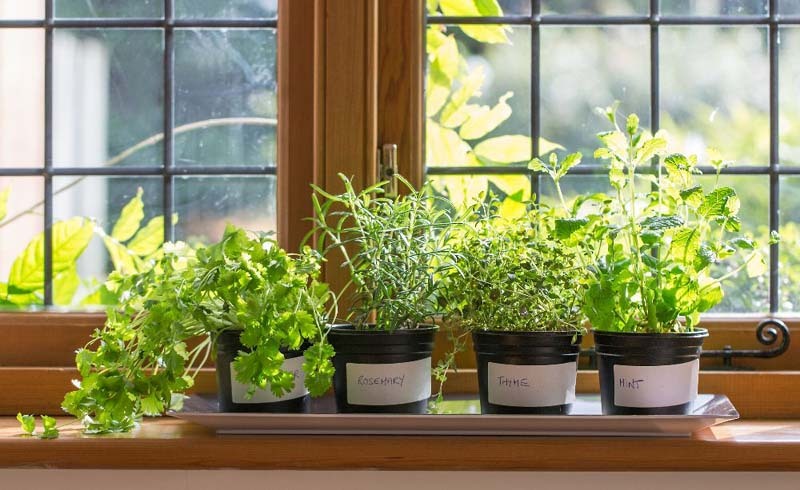 If you need herb garden ideas, glass jars are ideal candidates for your next indoor kitchen garden. Re-create this wall-mounted collection by first measuring and marking your jar placement on a piece of wood. Then, nail gold-painted clamps to the wood and slip glass jars planted with herbs between the clamps. Secure with a screwdriver. Finish by painting chalkboard labels, naming each herb, onto the wood. Project created by Claire Zinnecker for Camille Styles. Fashion concrete into a beautiful container for a small indoor garden idea look that can only be described as a work of art. 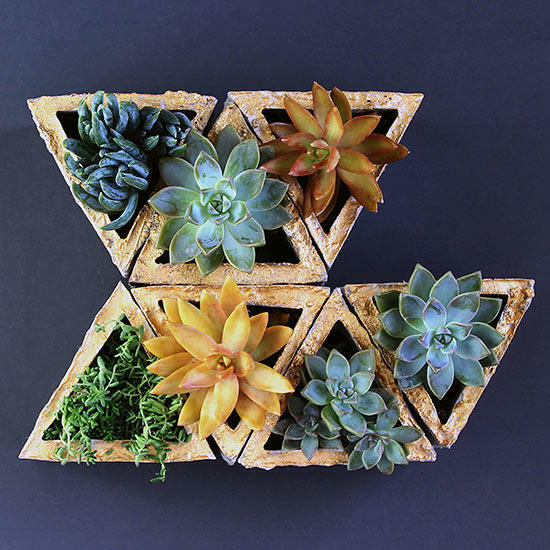 Make your own by pouring mixed concrete into cut and folded cardboard forms that are prefashioned with tabs to allow for drainage in the completed concrete pot. Allow the concrete to harden; remove the cardboard. Finish by painting the rim with gold paint and fill with soil and plants. Use them for succulents, herbs, or as an indoor vegetable garden. Project created by Ananda Yankellow. 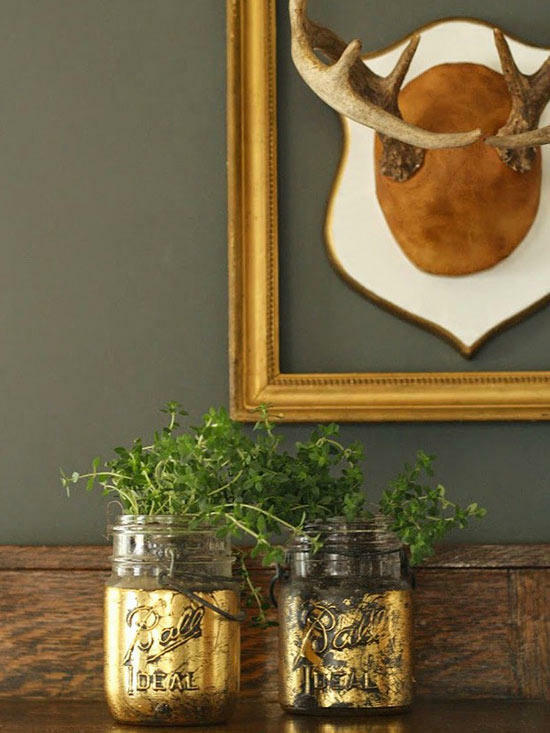 Give traditional Mason jars an updated look by adding herbs to the interior and a layer of fine gold leafing to the exterior, like in this home herb garden idea. Clean and dry a set of jars, then apply a specially formulated adhesive for gold leaf. Let it get sticky, then lay the gold leaf on top. Lightly peel away the backing paper and paint on a coat of clear Mod Podge to set it. Plant your herbs and display the indoor garden decoration on a shelf or tabletop within easy reach. Project created by Cassie Bustamante. Use your favorite home accessories as planters for an inside garden idea with tons of personal character. The types of threads housed in these repurposed spools are anything but synthetic! Follow this maker’s lead by slipping the roots of your favorite succulent variety—plus a bit of soil—down into the spool’s hole. Use a toothpick to help make room for the succulent’s stem if needed. Project created by Donni Webber. Is your house roaming with pets or kids (or both)? Try attaching your indoor garden for your apartment or home to the wall for your family's safe and stylish viewing pleasure! 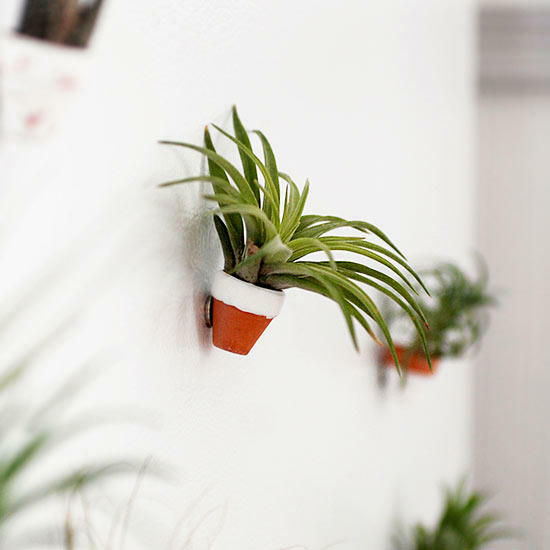 First, hang a specially made wall pocket suitable for planting. Then consult your local nursery for a variety of easy-care plants to add texture and visual appeal. Project created by Kim & Scott Vargo. Leather is no longer just for your favorite armchair! 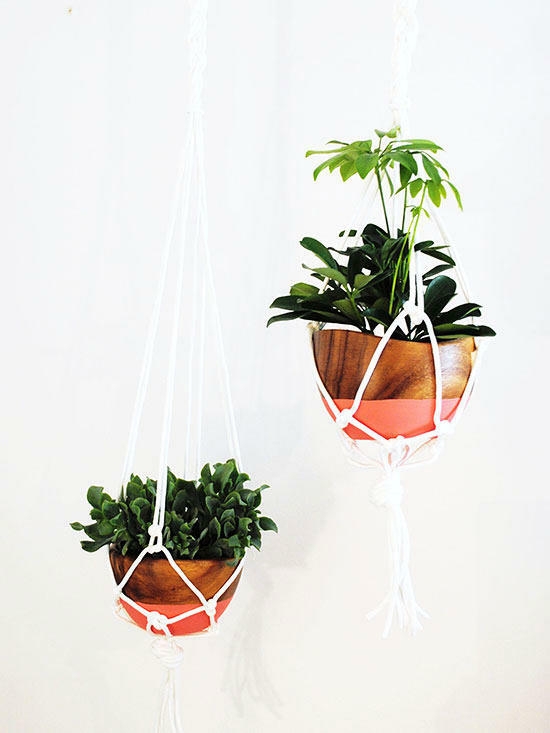 When manipulated with a pair of scissors and strung with rope, leather scraps can easily turn into on-trend hanging planters. To make this indoor garden design, just trim, add a pot, hang, and fill with your favorite variety of greenery for instant beauty. Project created by Debbie Wolfe. Make dishwashing a much more enjoyable activity by giving yourself something pretty to gaze at while you work. 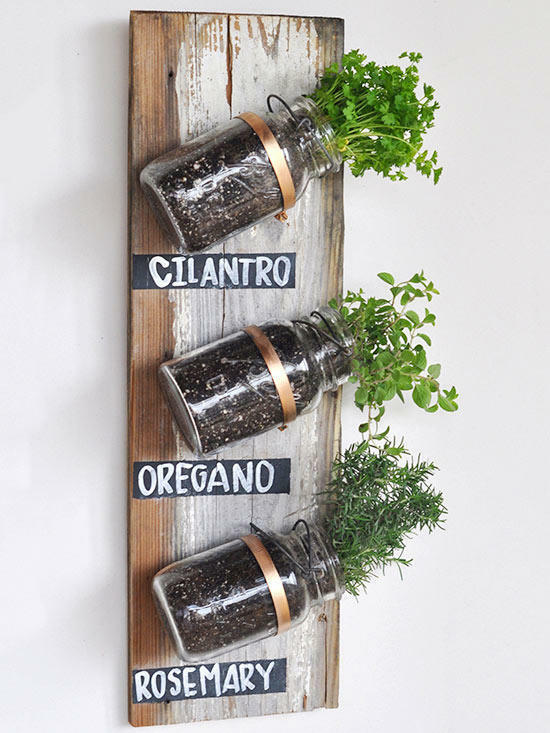 These DIY container herb garden ideas are easily re-created. 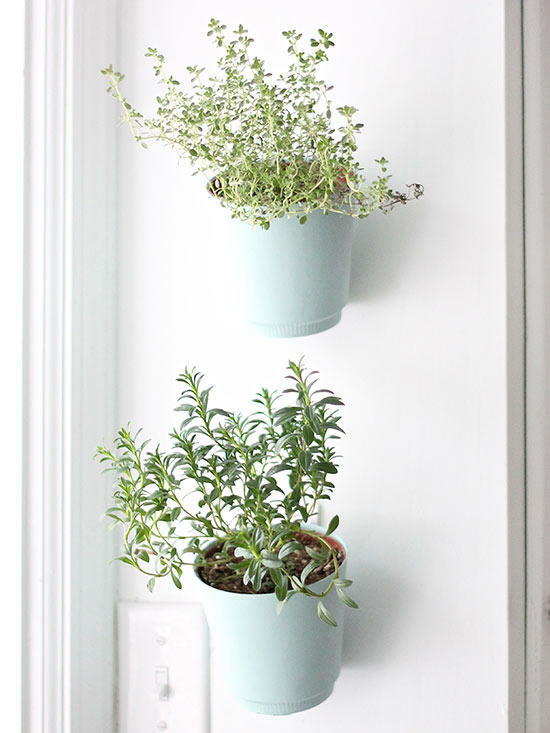 Drill pilot holes into plastic pots, then paint the pots your favorite color and hang them from the cabinet using adhesive hooks. Project created by Julie Blanner. 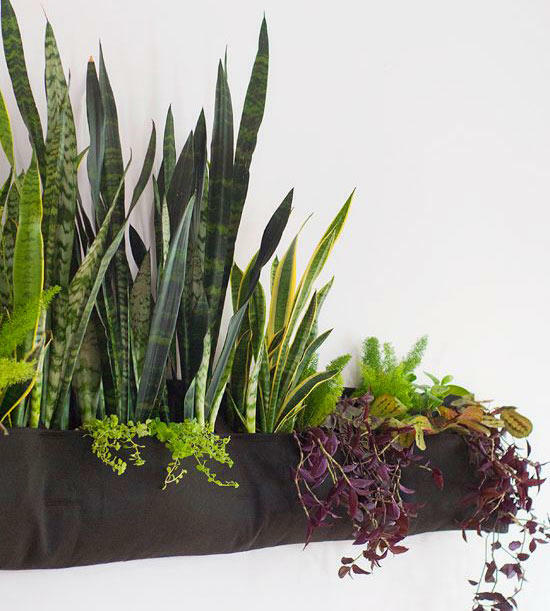 When it comes to this simple indoor planter trick, hardly any DIY or gardening skills are required! Just use a can opener to open a standard can, then remove the label and clean the outside and inside of the container. Finish this herb garden idea by adding potting soil and seeds, and then wait to see those shoots of green appear in no time. Project created by Rachel Faucett. You may have heard that adding live plants instantly ups the ante in your home, no matter where you put them. Well, there's truth to the claim, and even places like the refrigerator door can benefit from a pop of greenery! Make your own set of clay pot magnets by painting tiny terra-cotta pots and gluing magnets to the backs. Finish by sinking a miniature succulent or air plant inside the rim of each pot and hang it right on the fridge door for an instant indoor garden decoration. Project created by Manda McGrath. The retro art of macramé has been experiencing a major revival in the interior design world and, therefore, so is the art of the roped hanging plant as indoor garden ideas. These two swinging pots were made by tying concentric knots in white clothesline rope purchased from the hardware store. 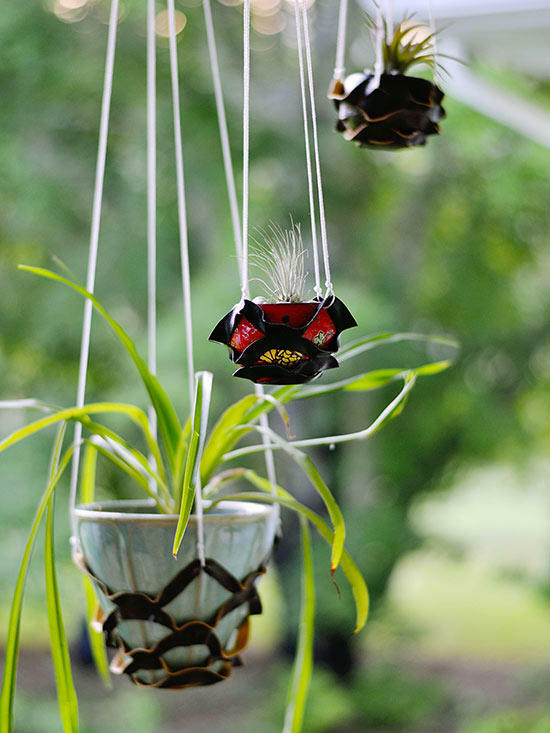 Before tying them up at the top, potted plants were set in the middle and hooks now dangle them from the ceiling. Project created by Mallory Nikolaus. Geometric prints help bring the age-old practice of gardening into the new modern era. 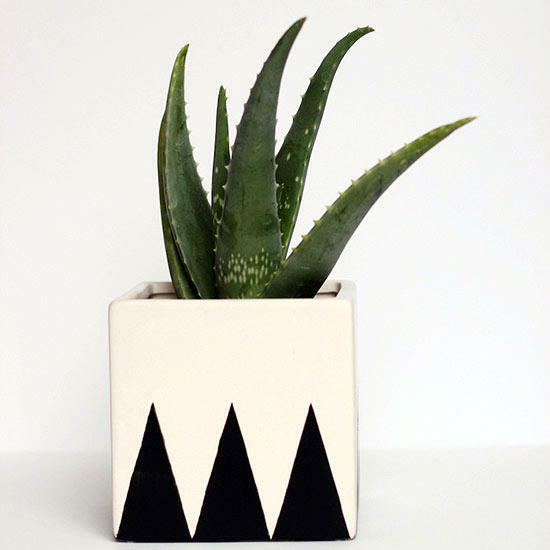 Re-create this contemporary indoor planter by first masking off your geometric print with a template, then painting with an accent color to make the design really pop. Repeat the process on all four sides and let it dry before adding a plant for a graphic mini garden inside the house. Project created by Jenny Batt. Stone planters are certainly not unique to the gardening scene, but these particular stones aren't quite what they seem. They actually were crafted using a combination of colored polymer clay for shape, and grated spices for added texture. 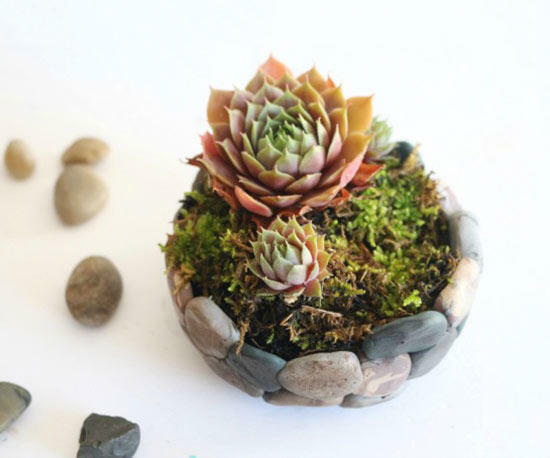 After pressing the stones into a bowl form, this small indoor garden idea was baked and then filled with moss and succulents for a finished look. Project created by Lucy Akins. 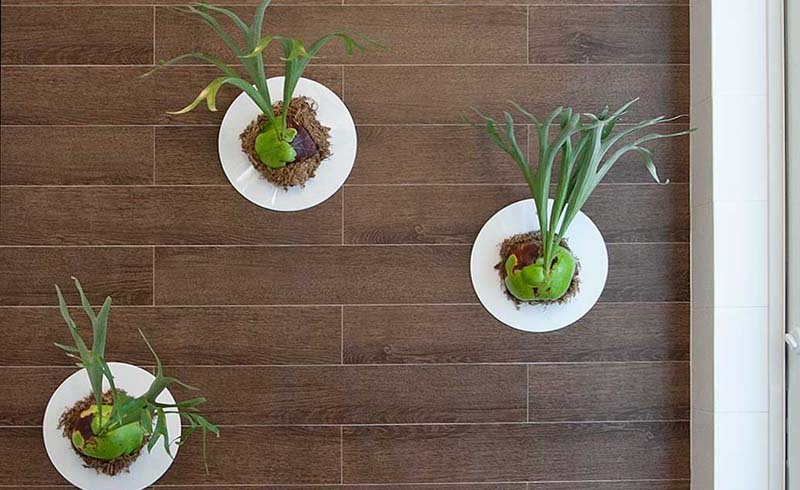 Indoor gardens that defy gravity are a popular home decor trend. Air plants, succulents and moss are taking new forms in many homes and apartments. 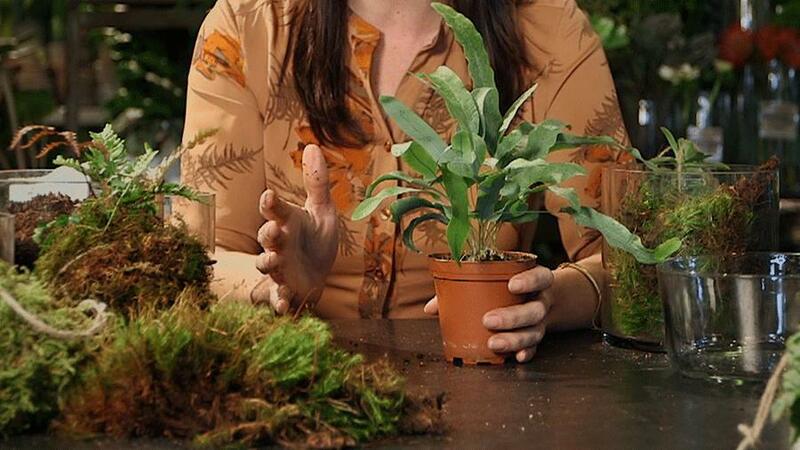 See how easy it is to make your own kokedama moss garden to add green to your collection of indoor garden ideas.